The original Washburn guitar factory was located in Chicago, around the corner from Maxwell Street, home to blues legends such as Muddy Waters and Howlin’ Wolf. With this in mind, take a look at the strings on your Washburn. Notice if they are rusty or discolored. Before you put off changing them, ask yourself if Muddy Waters would play them. If the answer is no, the time has come to give your guitar the attention it deserves. Rest your guitar on a flat surface. Place a towel under it if the surface is hard. 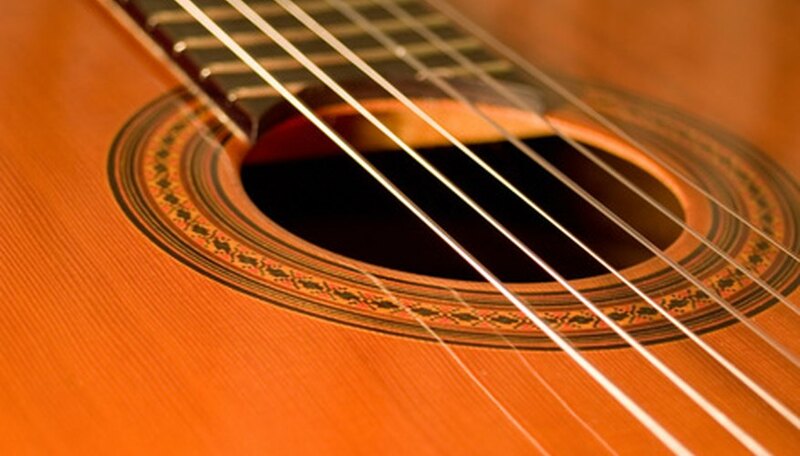 Using your string winder and loosen the tuning pegs for each string. Strike each string as you unwind. If the note drops, you’re winding in the right direction. Pull the strings out once you've unwound them enough so that they're easily removable from the headstock. Remove the bridge pins. The bridge pins are at the opposite end of each string from the tuning pegs. Most string winders have a notch designed to pry the pegs out of their holes. You can also use your fingers or pliers if necessary. Be careful not to scratch your guitar. Place a few drops of polish on your cloth and polish the guitar. Pay special attention to the neck, the headstock and all other areas that are hard to reach when the strings are on. Organize your new strings. They usually come color coded or with directions on the label. If all else fails, you can tell by feeling them where they belong in order from thickest to thinnest. The thickest is the low E. This is the top-most string. After this, the order is A, D, G, B and high E.
Place the ball end of each string in its hole on the bridge and replace the bridge pin. Be sure to align the groove on the bridge pin so the string fits inside it. Press the pins in firmly. Wind the other end of each string into its tuning peg. Strings are typically longer than they need to be. Give yourself enough string to wrap around three or four times. Cut off the excess with your wire cutters. Tune the strings. Guitar tuners, though frowned upon, make this easy. Turn the tuner on and strike each string while adjusting the tuning peg until the tuner indicates it is in tune. Always tune up to the note, never down. If you tighten the string too much, loosen it until it is below the correct note and tighten it until it’s in tune. If you’re using a piano, hit and hold a low E key while striking the low E on your guitar. Adjust the peg until the notes are the same. Repeat this for every string. Be aware that new strings require retuning a few times before they will remain in tune.